Jane Williams grew up in the inner city, and has had to learn from a young age how to take care of herself, and recently, the necessity of working hard for a better future. When she wins an enviable scholarship to Birchwood Academy, Jane is whisked away from her old like to a new, rich, comfortable one where her every need and desire is provided. But this new life isn't free—the mysterious headmistress and other influential people at Birchwood Academy have a secret, and they need her. But can Jane live with them and their secret, even if it means she never has to worry about money or lost opportunities ever again? Marta Acosta's Dark Companion reads like a dark, supernatural ode to the classic Jane Eyre. This modern day heroine, Jane Williams, is a tough girl and hard worker, but her background living in terrible foster homes and attending overrun public schools has taught her not to question her good luck, and she happily accepts her scholarship to Birchwood Academy, despite the red flags. The academy has the perfect shadowy, creepy setting for this twisted tale to play out. Jane settles into her little cottage and makes good friends there, but she is blinded from reality by her crush on gorgeous Lucky Radcliffe, son of her new headmistress, unable to see the terrible truths that lurk beneath the surface of Birchwood, and what they mean for her. When she discovers the truth, that she was brought to Birchwood for her blood, Jane does become a little passive, which is frustrating, but believable as a part of her journey to the realization that she is a person who deserves love and happiness and good things in life. The book ends with a fair amount of suspense and peril as long-hidden memories are unveiled and her future is complicated, but Acosta does give Jane a temporarily happy ending, which readers will appreciate. Dark Companion is a delicious mix of danger, romance, and unexpected magic that will make you shiver. Cover Comments: I like the darkness of the cover, and the trees in the background. The birches are a major part of this book! Very nice, very creepy! 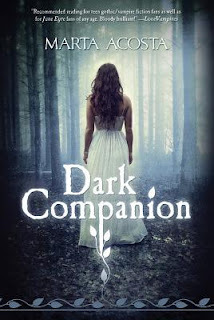 Dark Companion will be released on July 3rd, 2012! Advanced copy provided by author. Love ly review. :) I love dark, creepy and mysteripus books! I can't wait to read it! DARK COMPANION looks like story with some depth. Seriously lacking in the last two books I read.